Because coffee outdoors is trendy and we all long to be regarded as cool & fashionable you see an increasing amount of coffee paraphernalia being carried outdoors. While that’s appropriate for glamping, in my opinion it is uncalled for in the pack of an ultralight backpacker. Why I think that way and which tasty, ultralight coffee options there are, you find out in this article. I own an Aeropress since before it was trendy, we have a Chemex and regularly order coffee beans for a tasty cup of self-grinded afternoon coffee at home. If we don’t grind our own coffee we pick up the Fair Trade & Environmentally labelled coffee from the supermarket, all for a good cup of Joe. So you could say we like good coffee. But why would I say that that doesn’t need to be transported to the outdoors? Well, one thing is to simplify, to keep it light and simple. 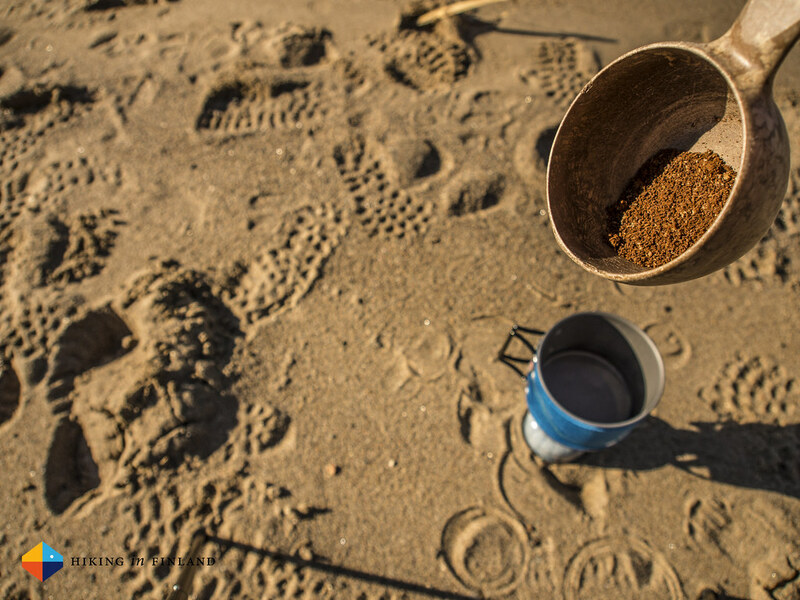 We often go outdoors to enjoy a simpler life, and carrying a whole lot of coffee making equipment outdoors seems to result in the opposite. Because even if I value a good cup of coffee, I feel carrying a grinder and an Aeropress outdoors just adds complexity to my outdoor coffee experience. Besides, I already drink Aeropress coffee at home every day, so I don’t feel a need to carry the kit along on a trip. I mean, I go outdoors to enjoy nature, the fresh air and the exercise, and also to escape the ordinary “home life” - why would I carry the same stuff along which I use every day at home? “But there’s no good alternative” some coffee enthusiasts might argue. I beg to differ. 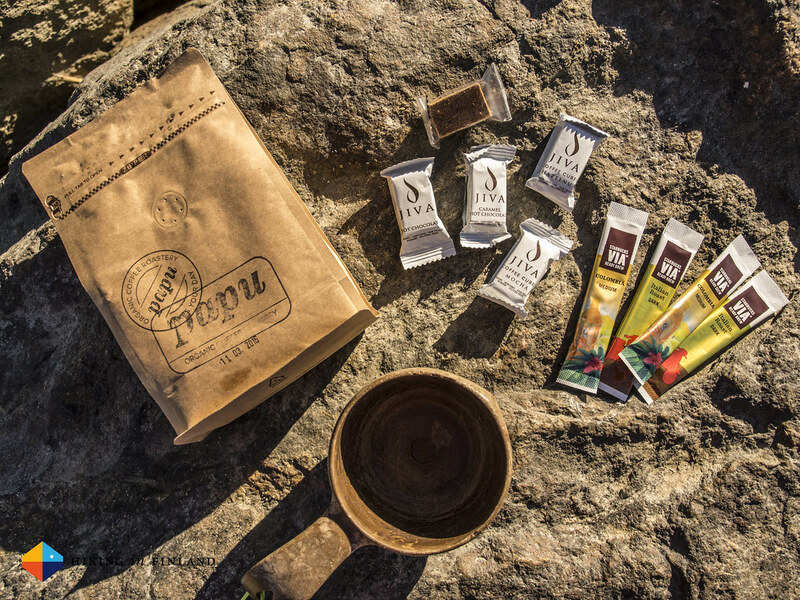 In my opinion there are three fantastic, ultralight options to enjoy a good cup of coffee outdoors: Cowboy Coffee, Jiva Coffee Cubes and Starbucks Via. 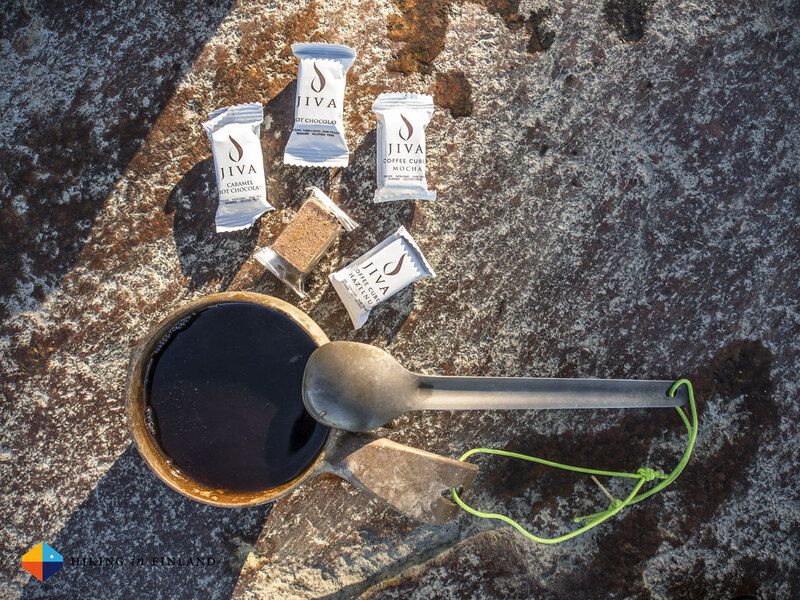 Jiva Coffee Cubes are the newest ultralight coffee on the market. I supported their crowdfunding campaign last year and got a wee package with a varied assortment of their cubes. They come in seven coffee tastes, from the Classic Coffee Cubes over the Mocha Cubes to French Vanilla Coffee Cubes, there should be something from them that will be to your liking. A 24 pack of coffee cubes costs $15 ($63 cent per serving) and one cube weighs 9 g. They are made of coffee and Panela, which is unrefined whole cane sugar. Their coffee cubes are slightly more sweet but not in a bad way (I drink my coffee black without anything) - I actually like the taste a lot, and find it on level, if not better, than Starbucks Via. Even if they are heavier than Via, I find them a great choice for backpacking trips. They pack small and are easy to use, and for coffee lovers who like to add sugar to their cuppa the Jiva Cubes could mean that they can leave the sugar at home. The many different tastes all are equally good, though I like the stronger Cubes for some extra caffein punch in the mornings. They need a bit of time to dissolve and you want to give your cup a good stir for the best taste experience. I recommend to order one of their assortment boxes to give them a try and see if you like them. Starbucks Via is since many years the choice for ultralight backpackers. At 3 g a serving they really are ultralight, and they are super easy to make: Open packaging, pour the powder in your cup, add hot water and you are done. You don’t even need to stir! At 0,67€ per serving they are slightly more expensive than the Jiva Cubes, but they are one third of the weight and in a pinch you can use the packaging as a spoon to stir your cuppa. The taste is great in my opinion, the only downside is that they can be a tad difficult to find in Europe. You love your self-grinded coffee you drink at home? Then just take it along on your next hike and drink it cowboy style! It’s the easiest, lightest and probably best way to enjoy a good cup of coffee outdoors. Besides hot water, a cup and your coffee all you need is a wee bit of patience to let the coffee settle on the bottom of your cup after you poured the hot water over it, and you’re ready to enjoy it. There’s several guides online (read Dave’s) if you’re new to this, but it is difficult to do anything wrong with this method. It actually is the same way that coffee is drunk in many countries, from Turkey to Bosnia and Herzegovina, where real coffee is served “Cowboy Style”. 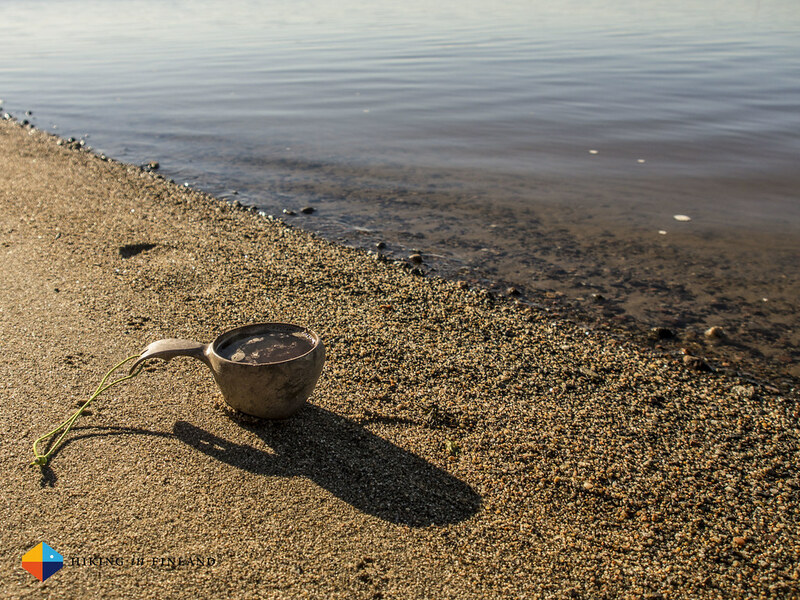 The taste is excellent (even better when prepared near a camp fire!) and you will quickly realize that an Aeropress isn’t needed on your backpacking trips! If you don’t like the “gritty” Cowboy-Style, try the GSI Java Dripper or a Filter Holder. These weigh only just a couple of grams, pack small and are an acceptable, lightweight tool to make a cup of coffee without getting any coffee grounds into your mouth. Now you have everyhting you need to know to enjoy the perfect cup of outdoor coffee, thus go and have a cuppa - outdoors! Don’t agree? Comment away, but remember to be nice & civilized!